Tokyo, Oct 23 (IANS) Japanese Prime Minister Shinzo Abe has promised to take a firm stance on North Korea, after a predicted landslide win in Sunday’s snap general election, the media reported on Monday. “My immediate task is to deal with North Korea,” CNN quoted Abe as saying late Sunday night to the media. 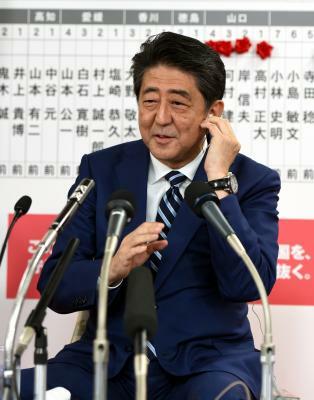 Abe had called the snap vote to seek a boost to his parliamentary majority and is likely to use any new powers to attempt to overhaul the country’s defence strategy. An exit poll by public broadcaster NHK forecast a decisive win for Abe’s coalition, saying his conservative Liberal Democratic Party (LDP) would take 253 to 300 of Parliament’s 465 seats. 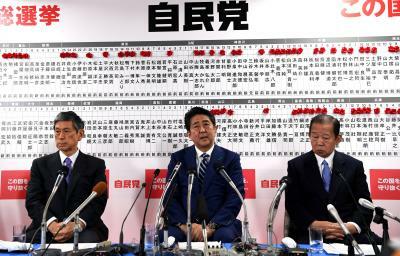 The Komeito party, which is in a coalition with the LDP, is predicted to take 27 to 36 seats. The official result is expected by Monday. In the face of an increasingly hostile North Korea, Abe earlier this year set a deadline of 2020 to revise Japan’s constitution, which contains language that bans Japan from maintaining armed forces, reports CNN. It is a controversial proposal that strikes at the heart of the country’s post-war identity. The forecast win also put Abe, 63, on track to become the longest-serving leader in the country’s modern history. “I must face with this victory with humility,” Abe told NHK after the exit poll results. In the lead-up to the snap election, all eyes were on the recently-formed conservative Party of Hope led by Tokyo Governor Yuriko Koike, with some speculating that it would make significant gains, reports the BBC. Koike, who was in Paris for a business trip during the election, told reporters she was personally taking responsibility for the result. Japan has faced increased hostility from North Korea. Pyongyang flew two projectiles over Japan last month, including a ballistic missile, in act of defiance against the US and the international community.